Granita is a Sicilian dessert made primarily from ice and sugar, flavoured with anything from fruit to coffee. 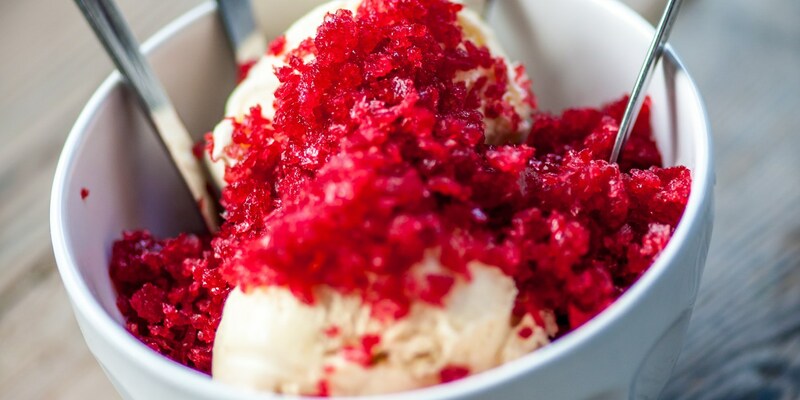 It has a coarser texture than sorbet, which in part comes from its interrupted freezing process - the dessert is flaked with a fork regularly during freezing, in order to form crystals. For a fresh tasting cocktail alternative in the Summer, serve up Marcus Wareing’s gin and tonic granita, an adult treat that looks stunning garnished with edible flowers. Make the most of seasonal fruit with Adam Bennett’s strawberry granita, served with poached peach, or try Emily Watkins’ rhubarb granita recipe for a perfect marriage of British and Italian flavours - the refreshing ice is paired with creamy custard and crumbly shortbread. For those without such a sweet tooth, try Graham Campbell’s innovative Alaska crab recipe. Served with a tomato granita flavoured with white wine, fennel and coriander, it proves that granita is by no means limited to desserts.